By many accounts, the shelter referral centre at 129 Peter Street is itself regularly over capacity. Patrons regularly sleep on the referral centre’s floor and chairs. Their inability to access dozens of reportedly empty beds might be due, in part, to the fact that men cannot access women’s shelters, and adults cannot use youth facilities. Empty beds that don’t correspond with need—based on gender, age, physical ability, or location—offer no comfort to those who cannot use them. The squabble over beds is taking place in the context of Toronto’s ongoing affordable housing crisis, which City staff have thoroughly documented and politicians have universally decried. 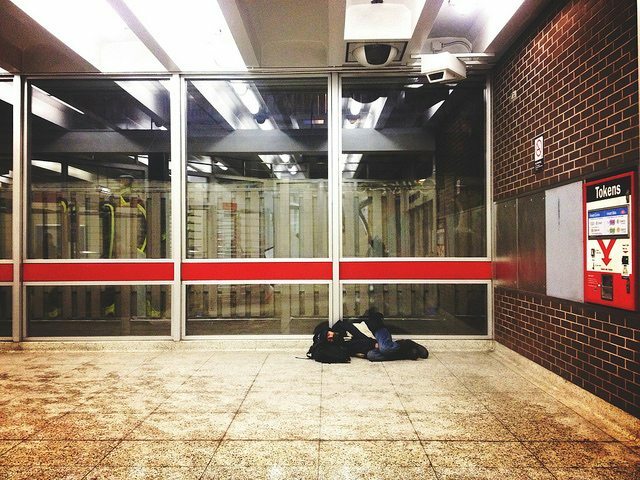 The mayor and some councillors seem reluctant to consider warnings from front-line workers over the reliability and usefulness of official statistics about emergency shelters, but the idea that shelters are under serious pressure isn’t far fetched when we examine what we already know about housing in Toronto. 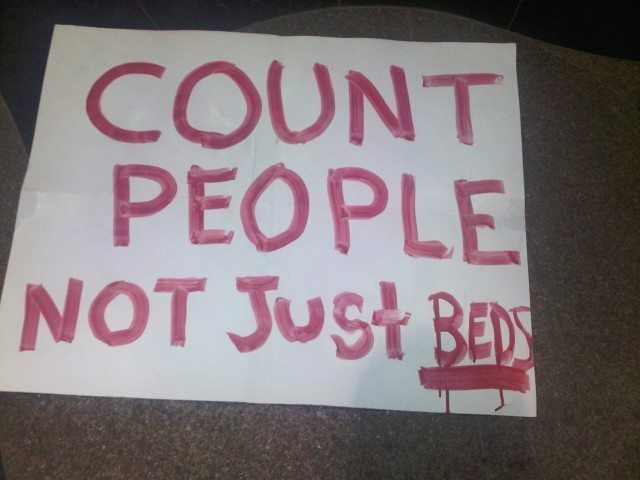 A sign at a recent Metro Hall sit-in to protest shelter access. Photo by Desmond Cole/Torontoist. Between November 2012 and January 2013, Toronto’s affordable housing wait list [PDF] shrunk by 620 people. The remaining 161,266 people in line can comfort themselves that at this pace, it will only take about 40 years to clear the backlog, assuming no one else trying to make rent in Toronto applies for assistance. The public housing we do have is costing us so much in upkeep that, late last year, the Ford administration decided to sell some of it to pay for at least a few repairs. We lost housing, and we’re still in a huge maintenance hole. Toronto Community Housing warns that the housing stock may be threatened further, and “fewer units would mean low-income Torontonians could be denied the housing stability they need,” TCHC’s website states. Given all this, a 96 per cent shelter capacity rate should get more attention at City Hall than it has to date. A report released on Monday [PDF] suggests that most of the surplus beds are for single men, and that spaces for all other groups are extremely tight. City officials acknowledge that inefficiencies and poor staff training could mean people are wrongly being deprived of shelter. They also admit that occupancy rates for the first months of 2013 have exceeded their initial estimates. Last week, after protesters created a makeshift shelter at Metro Hall to call attention to the issue, Rob Ford held a press conference to address the situation. In his remarks, he maintained that it was the Ontario Coalition Against Poverty—an organization that many connect with militant ideology and disruptive tactics—that had an issue, but that overall, matters were under control. He seemed to think that by invoking OCAP, he could discredit any criticism of shelter access. But Social Planning Toronto recently surveyed workers at 15 Toronto shelters, and their accounts seem to confirm observations by OCAP and other community groups. “Generally, we send people away every night,” one worker reported. “Ninety women were turned away [in the past month] due to lack of space, and referred to the Assessment and Referral Centre,” said another. Most of those surveyed think the city should boost its shelter capacity immediately. Mayor Ford seldom displays any curiosity about the welfare of the homeless. (Recall his language as a councillor in 2002, when he infamously said that the prospect of holding a public meeting to consider opening a shelter in his Etobicoke ward was about as absurd as proposing a public lynching.) The Community Development and Recreation committee will discuss today’s report on shelter access next week. Even before its release, however, the mayor promised that the shelter system “is working great,” as if those occupying the floor at Peter Street are well served by the status quo. City council would be wise not to dismiss the multiple warning signs as easily. The Out of the Cold program, a church-run shelter initiative during the winter months, will stop offering 88 shelter beds once Easter arrives. Unfortunately, the ongoing pressure on our emergency shelters isn’t going away any time soon.